West End Presbyterian Church is using the Scripture readings recommended by the Revised Common Lectionary as a framework for our corporate worship and our personal and family devotion. This project is part of WEPC's 25th Anniversary Year and will run from December 2018 through November 2019. The Lectionary gives us access to the whole counsel of Scripture and these texts are a means for us to grow in our understanding of our union with Christ. 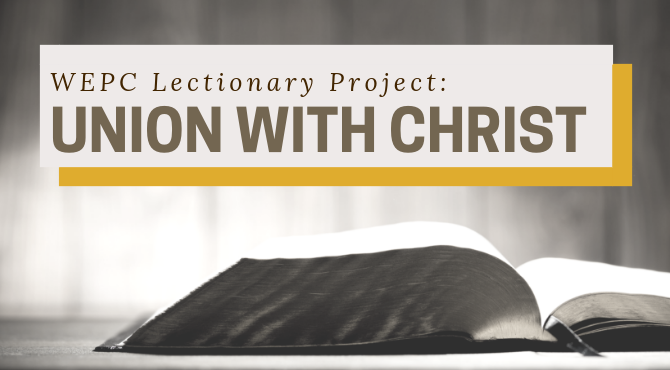 What is the Revised Common Lectionary (RCL)? The RCL is a three-year cycle of Scripture readings broadly used by Protestant churches. Beginning with Advent, we'll use the cycle known as Year C. These cycles are built around the seasons of the Church Year. During first half of the cycle, we'll follow the earthly ministry of Jesus and the coming of the Holy Spirit to His Church. The second half of the year, we'll focus on Christ’s Mission through His Church. The selections are Old Testament, Psalm, Epistle, and Gospel readings from the ESV translation of the Bible. When does this project begin? WEPC Daily Readings, the daily email based devotional resource will begin on November 29. We will begin to preach through the RCL texts beginning with the First Sunday in Advent: December 2. And you can jump in at any point in the year! What are the WEPC Daily Readings? Using the Lectionary can get complicated for those new to the practice. We'll take a very simple approach. The RCL centers on our gathered worship each Sunday, and the daily readings help us prepare for (Thursday-Saturday) and reflect on (Monday-Wednesday) each Sunday’s service of worship. How can I use the WEPC Daily Readings? Keep them handy to read aloud before a meal with family or friends. Reflect on a reading as you start your day or wind it down. Begin you group, class or team meeting with someone reading the Scripture. Read a selection before you pray with a friend. How will this change our worship service? The Lectionary will serve as a guide for our sermon texts and services. Instead of finding Scripture readings and Psalms to complement the sermon text, we'll use what the Lectionary prescribes. We'll also use the Psalm for that Sunday in our prayer time, and publish the RCL readings for the week. The leaders of WEPC are excited about the church having the opportunity to worship together & reflect on Scripture daily.